The ETC line of Bo Bunny is perfect for a modern take on the vintage and distressed look. Iris only needed a few papers, embellishments and rub-ons to achieve this look without the mess and stress of having to age and distress papers. For that special occasion the Bo Bunny Enchanted range is romantic and elegant. Chris has added some colour with Aussie Scrap Source textured cardstock to make these cards pop. Some Prima flowers and pearls finish them off beautifully! Sharing her Bo Bunny layouts with us is Leah Cameron. Leah has used the Enchanted range to create these gorgeous layouts of her little girls. 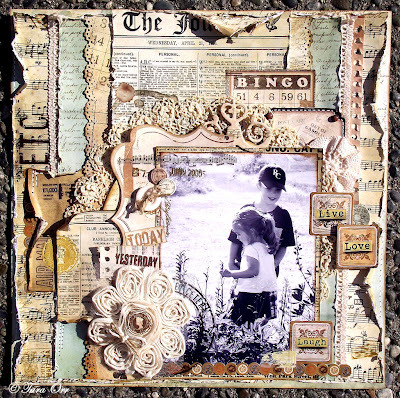 She has layered the papers as well as using the flourish frame to make her photo the centre piece. Thank you for showing us how fantastic these paper can look for girlie layouts Leah! Tara Orr has created this breathtaking page using the BoBunny et Cetera range. The layers and details in this page keep your eye travelling over every inch of the page, and yet because of its muted and neutral tones it doesn’t look busy at all. 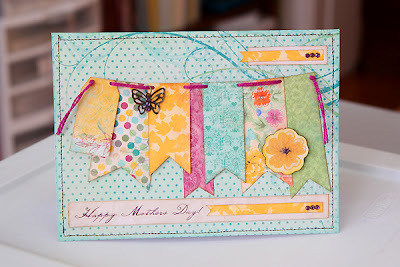 And check out this gorgeous mother’s day card idea from Juliana Michaels. She has used the stunning Ambrosia line – perfect for airy feminine projects.